Maybe you have no desire or wherewithal to own a fiberglass, aluminum or wooden boat and deal with everything involved. Everything involved includes maintenance, the trailer, boat ramps and owning the right vehicle for towing. Yet you still want a boat -- something more than a canoe, kayak or raft -- for fishing. SeaEagle’s FishSkiff might be for you. This is an inflatable, patent-pending and revolutionary skiff for fishing, the company says. The 16-footer, weighing 94 pounds without the motor transom, rolls up to be carried in the back of a car or a trunk. Yet this boat has the speed to zip around at up to 17 m.p.h. with a 6 h.p. engine. A trolling motor that can be easily attached can quietly sail you from fishing hole to fishing hole with stealth, once you reach the fishing grounds. The hull is tough as crocodile hide, Sea Eagle says, and features three separate air chambers for safety. Built to be easy to fish for one or two anglers, the skiff is self-bailing and fuel efficient, and has draft as little as 6 inches and a design to get the hull up on plain when traveling. It can be fished from skinny water to deep. 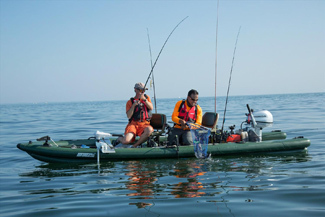 Sea Eagle makes a variety of inflatable fishing boats that show ingenuity. 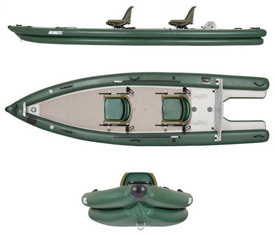 The FishSkiff is one of the newest, and two others that are new are the Fishing Explorer, kind of a beefed-up kayak, and the FastTrack, featuring a “Needleknife Keel” for speed. 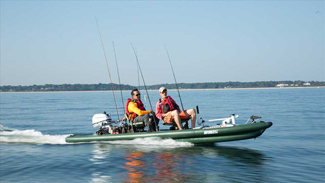 Click here to see all of Sea Eagle’s inflatable fishing boats. The company also makes other inflatable boats and inflatable kayaks, canoes, SUPs and wave boards. For details about the FishSkiff, visit Sea Eagle’s website.